Surely her new bosses aren’t serious about making their exclusive ghost tour stops even more haunted by helping senior citizens leave this world a bit early? Ever visited the death site of someone famous? Book info: Just Kill Me / Adam Selzer. Simon & Schuster Books for Young Readers, hardcover 2016, paperback 2017. [author site] [publisher site] [book trailer] Review copy and cover image courtesy of the publisher. My book talk: Ghost tours in Chicago are truly a cut-throat business, Megan discovers as she begins working for Cyn and Rich, who may just be creating a few new ghosts of their own to compete with the big companies. Megan grew up in a funeral home (a “black diaper baby”), is comfortable with death (naturally), doesn’t believe in ghosts (ditto), but does need a summer job after high school graduation – perfect for the ghost tour biz (as long as Mom doesn’t find out). As she learns the stories behind famous crime scenes, infamous murder sites, and secret haunted spots, Megan wonders if Cyn and Rich really see the spirits they point out to tourists. When new ghosts appear on the tour just after her bosses take their nursing home patients on evening outings, she ponders the coincidences. Cyn continues commenting on Megan’s resemblance to a flapper who mysteriously disappeared in the 1920s, so it’s time to dig into history and get her secretive online-but-no-photos girlfriend to help unravel the mystery… before it’s too late! Lois Lane: Double Down, by Gwenda Bond (book review) – crime, corruption, conspiracy! Yes, that Metropolis, where student reporter Lois Lane is tracking down city corruption, worrying about online pal (maybe more?) SmallvilleGuy, and trying to keep a low profile at school, while learning how this ‘being a friend’ thing works (Maddy has a twin?). Second in the series, but if you haven’t read Lois Lane: Fallout (my no-spoilers recommendation here) you can still enjoy Double Down as backstory to the well-known Superman saga. Any advice about friendship for moved-too-many-times-to-count Lois? 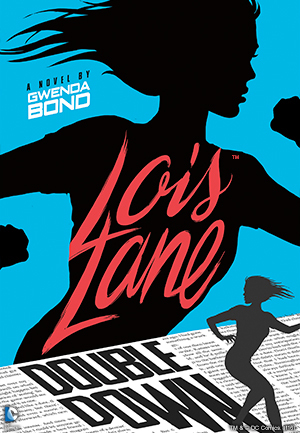 Book info: Lois Lane: Double Down (Lois Lane, book 2) / Gwenda Bond. Switch Press, 2016. [author site] [publisher site] [author interview video] Review copy and cover image courtesy of the publisher; all opinions are my own. My book talk: When Lois discovers her best friend’s twin in a perilous situation, the student reporter begins to unearth a diabolical doctor’s connection to Metropolis’ underworld while a conspiracy theorist online threatens her friend Smallville Guy. It should have been a routine news story about a young mural artist, but Lois finds Maddy’s too-cool twin sister delirious and searching for a mysterious doctor in Dante’s slum neighborhood. ‘The Boss’ controls this slum, rumor says, along with much of Metropolis behind-the-scenes, so Lois’ nose for news is on the hunt – is the new mayor in his pocket? Her online friend SmallvilleGuy is concerned about new predictions of ‘flying man’ sightings, as reported on their favorite discussion site – how could Insider01 really know? Maddy and Melody say that the supposed ‘twin connection’ is just a myth – why is Melody seeing through someone else’s eyes now?! a chance for an epic senior year… and maybe love. 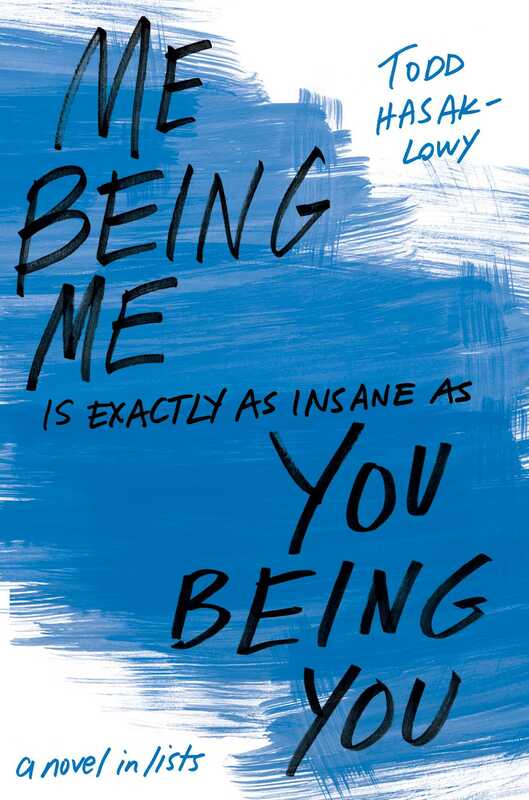 Meet Georgia (and snarky best pal Liss) in this excerpt, courtesy of the publisher – check out her Do Everything Be Brave List, then get the whole story of how she tackles the list, copes with heartbreak, and struggles with body image. This isn’t one of those “my mom died and I will mope through life until someone else makes it worthwhile” stories. Georgia creates her own ups (and downs), although Liss and Evelyn are with her for many things. I loved the way that Georgia would reframe negatives into possibilities (although not always with ease) and the winding routes that her thoughts took as time passed, too. What’s on your Do Awesome Stuff list? 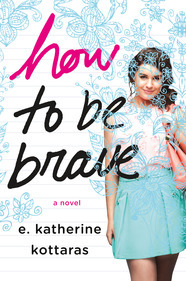 Book info: How to Be Brave / E. Katherine Kottaras. St. Martins Press/ Griffin Teen, 2015. 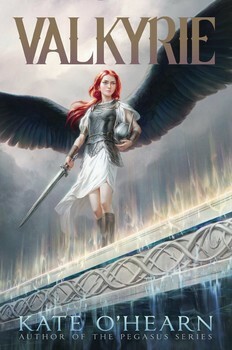 [author site] [publisher site] [interactive book trailer] Review copy and cover image courtesy of the publisher. My book talk: Inspired by her late mother’s letter, Georgia makes a list of daring things to do during her senior year, little realizing how much she and her friendships and her dreams will change along the way. So she and best friend Liss and new pal Evelyn start in the middle of the list and work their way around to tribal dancing (and maybe Georgia will ask Daniel out, some time). 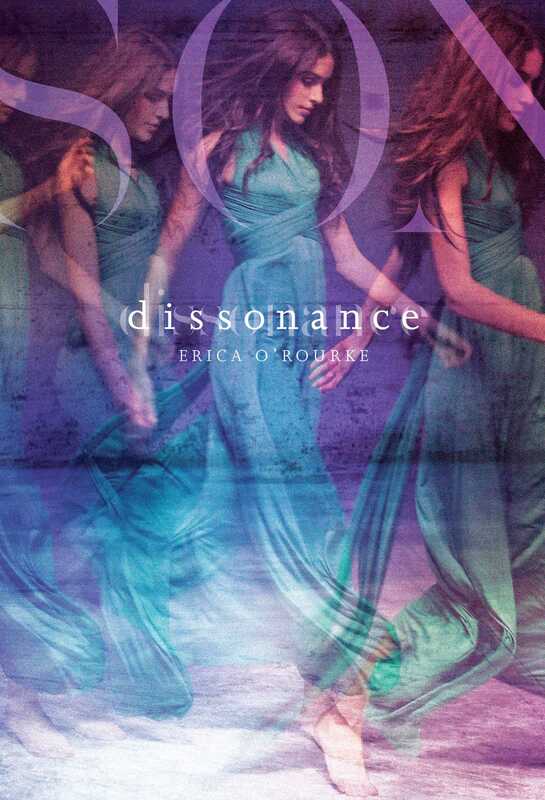 But one ill-timed party fractures their friendship, and senior year’s zip turns to blah. Is it worth doing the adventures on her list alone? Can she ever get Liss back on her side? Will she be brave enough to leave behind her mom’s artistic style? Change is scary, but staying the same on-the-sidelines-of-life chubby girl is not an option for Georgia after Mom’s last request entreating her to learn How to Be Brave. 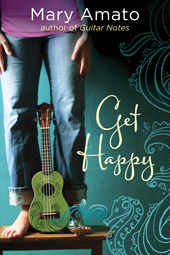 Teen songwriter wants an ukulele and better days. Teen’s long-gone dad wants to see her at last. Teen’s hyper-organized mom wants him to stay gone. As the Rolling Stones sang, “You can’t always get what you want,” but be assured that the teens eventually do get what they need, even if they don’t know what it is Read on, read on!